Zinc oxide sunscreen offers sun protection without damaging your skin. 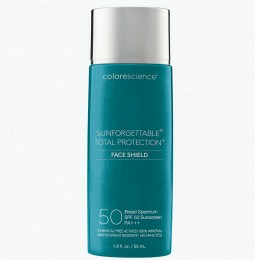 Shop ColoreScience for zinc oxide sunscreen products that protect your skin while providing luminescent skin coverage. What Does Colorescience Offer As Far As Options For Zinc Oxide Sunscreen? Colorescience has three options when it comes to zinc oxide sunscreen. 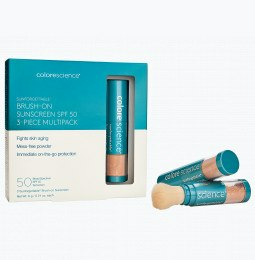 For those who like to stock up, Colorescience Brush-On Sunscreen Multipack features three brush-on sunscreens with broad spectrum SPF 50 in the medium shade. 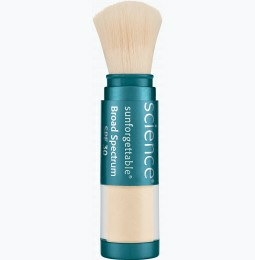 Sunforgettable Brush-on SPF 50 protects against the sun’s harmful UVA and UVB rays with sunblock zinc oxide for all-natural defense. Powder sunblock for sensitive skin can be worn alone or over makeup, so throw this pocket-sized sunscreen in your bag on days when you’re not quite sure what your schedule will bring so you can effortlessly apply on-the-go. 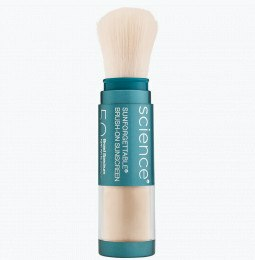 Colorescience Brush-On SPF is the best sunscreen for acne prone skin because it’s non-comedogenic, meaning it won’t clog pores and cause breakouts. If you’re looking for sunscreens made without harmful chemicals, browse our assortment of zinc based sunscreen powders without Oxybenzone. Oxybenzone is a dangerous ingredient common in sunscreen that wreaks havoc in our bloodstream and destroys ocean ecosystems. It’s so bad that Hawaii has recently banned chemical sunscreen altogether! We don’t think skin protection should come with such a steep price. Here you’ll find coral reef safe sunscreen that’s good for you and the environment—so stock up before your next tropical vacation! All of Colorescience products are made with integrity, from our healthy lip gloss to our nourishing skin care. Does Zinc Oxide Leave A White Film Residue On The Skin? Gone are the days when people walked around with that thick, chalky white zinc on their noses and other body parts. These sunscreens appeared thick and white because the ingredients scattered all colors of visible light nearly equally. Today, these ingredients have been reduced to much smaller particles in zinc powder sunscreen, allowing a protective cover that blends into the skin while still providing the right amount of SPF and UV protection. Why Does Zinc Oxide Provide Great Protection? Zinc oxide sunscreen for face and skin offers fantastic broad spectrum protection, without making the body vulnerable to harmful effects of other sunscreen ingredients. Have sensitive skin? Invest in sensitive skin sunscreen with SPF 50. The ingredients in both zinc oxide sunscreen and titanium dioxide sunblock don’t break down in the sun, providing greater protection from UV rays than almost any other sunscreen chemical approved in the U.S. 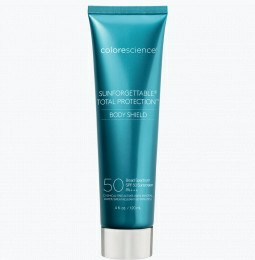 If you forgot to apply your SPF before going out into the sun, zinc oxide powder may be effective at healing wounds and reducing the tenderness you feel after getting a sunburn.Colorescience offers a wide range of mineral sunblock SPF 50 products. Invest in healthy, glowing skin today with our line of products with zinc oxide sunscreen, designed with your skin in mind. Great product for sunny days. I love Sunforgettable and have been using it for years. It's one of the only sunblocks that doesn't run into and burn my eyes. I also use it on my 12 month old and 6 year old daughters. Most of us spend more than 10 hours per day in front of screens. That may sound like a lot of time, but when you factor in your desk job in front of the computer, Netflix watching and Instagram scrolling before bed, the 10 hours adds up very quickly! All of this screen time can wreak major havoc on your skin. Lucky for you we created the solution with our new Sunforgettable® Total Protection™ Brush-on Shield SPF 50. Powered by our new proprietary EnviroScreen™ Technology, our all-powerful, all-mineral brush offers total protection from blue (HEV) light, as well as UVA/UVB, pollution and infrared radiation. It isn’t just the sun that’s causing those fine lines, wrinkles and age spots. Exposure to all environmental aggressors contributes to skin damage!